Can you provide an overview of how your site works? All About Organics Online is an online store, where you can browse and select from a range of approximately 4,000 organic and natural products. If a product is visible on the site at the time of ordering, this means it is in stock and available for you to purchase, provided that at the time of picking and packing your order it meets our standard of quality. Though it is certainly our aim to fulfil 100% of your order, it is for this reason that we cannot guarantee 100% availability of stock. When we do not have an item in stock, it will disappear from the site and will only reappear when we receive more stock. This site will only ever allow you to order up to the amount of stock that we have available at the time of ordering. There is a $40 order minimum for all purchases through the site. This does not include the $9.95 flat rate delivery fee. So that you can order and receive your milk and bread as fresh as possible, we’ve created a table that details the brands that we stock and the days that we receive fresh stock in from them. You can view this here. Our online store allows you to filter your search for products according to a list of attributes that appear below the product category tree when shopping online. To do this, simply click on the attribute you would like to filter your search by. Please note that only the attributes listed on the product or claimed by the supplier are assigned to the product. All About Organics Online uses ANZ’s Secure Payment Gateway to process payment for all orders. Staff members do not at any stage deal with customer credit card details. Payment is accepted from Mastercard and Visa credit cards only. We charge a flat-rate $9.95 delivery fee for all orders. We deliver six days a week–Monday to Saturday–with 3 timeslots available on weekdays and one timeslot available on Saturdays. For more information on order cut-off times, see here. Please note that deliveries are not available on Sundays or public holidays. We service most of Metropolitan Melbourne. To check whether we service your suburb, see our comprehensive list of suburbs we service here. Yes, there is a $50 order minimum. This does not include the $9.95 flat rate delivery fee. We are an online store only! If you’d like to know more about a particular product or have any questions for us, you can reach via email at customerservice@aaoo.com.au or by calling 03 9836 9537. We are not able to process any orders over the phone, as the software used to allocate stock to your order and process your payment requires that you place your order through the site. What are your order cut-off times? Can I make changes to my order once I’ve placed and paid for it? We are not able to add products to an existing order as we do not carry your payment details and thus cannot process payment. If written notice (via email: customerservice@aaoo.com.au) is received within the time frames outlined below, you can place a second order and we will refund the second delivery fee paid for that order (provided that it is to be delivered with the first order placed). The site cannot process any orders under $50 and therefore the second order you place will have to meet the minimum $50 spend. If I’ve ordered an item that is out of stock, do you substitute it with a product similar? If you have ordered an item that was in stock on the site but at the time of picking and packing your order was either unavailable or not to our standard of quality, we will not substitute the product with that of another brand or supplier, as we believe that you have browsed for, and selected that particular product in line with your own personal tastes and criteria. Instead, we will refund you the price paid for the item that was not packed with your finalised order. I have been refunded for an item I ordered but did not receive in my delivery – when will this reach my account? We issue refunds through ANZ Bank’s secure payment gateway. Any refunds will reach your account within 3 to 5 business days of the issue date, depending on the processing time of your financial institution. If you ordered an item, but it is missing from the order you received, it is possible that the item was either not in stock or not did not meet our quality standards at the time of picking and packing your order. Carefully check to see if the item was included on the Tax Invoice that was sent to you as your order was finalised and shipped. If the item does not appear on your Tax Invoice, then the price paid for that item will have been refunded to your original means of payment, which will reach your account in 3 to 5 business days. If the item appears on your Tax Invoice and you have not received it with your order, please contact our customer service team via customerservice@aaoo.com.au or on 03 9836 9537 as soon as possible. All of our fresh produce is Australian grown and certified organic. We do our best to source our Grocery and Refrigerated items with organic certification, however not all of our products are certified organic. We have thus done our best to categorise our range of approximately 4,000 products so that you can easily distinguish what is certified organic and what is not. To shop only products that are certified organic, simply click on Shop Online from the main navigation bar, then scroll down until you reach the product attribute key and click Certified Organic. This will narrow down the range of products to just those that are certified organic. Many of our products also carry descriptions that appear when you click on the individual product, and for products that are certified organic, the body that has granted the product certification will also be stated. How can I view orders I’ve previously placed? You can view all the orders you have placed through the site by logging into your All About Organics Online account, selecting My Account from the navigation bar at the very top of the page and then selecting Orders. 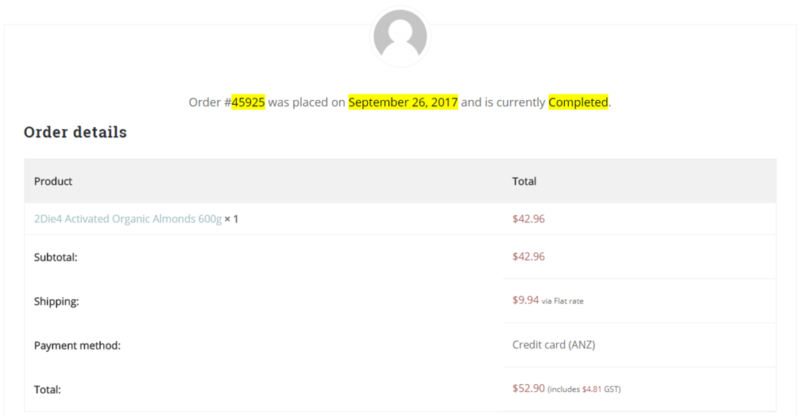 You can view the details of each order by clicking the Order # or View (as pictured below). Among other details, this will show you a list of the products in your original order (see example below). To identify products that were ordered but not included in the finalised and shipped order, you would need to compare this with the Tax Invoice sent to you via email. We deliver six days a week, Monday to Saturday. Please note that deliveries are not carried out on Sundays or public holidays. We don’t deliver on Public Holidays. Am I required to be home when my order is delivered? If you are not home when your order is delivered, the delivery driver will leave your order by the front door, or in a place specified by you in the delivery notes. We do however recommend that you unpack and store your order as soon as possible. If the delivery contractor/company needs access through a security door to deliver your order, you will need to be home at time of delivery. If you are not home and are not contactable by phone, the delivery driver will bring your order back to our warehouse. If we arrange a new delivery window with you, you will be charged a second delivery fee of $25 for that order. Where do I specify instructions for the delivery driver? How are chilled and frozen items delivered? We deliver chilled and frozen items in cooler bags designed to keep designed to keep items cool for 4 hours and frozen for 3 hours. We do however recommend that you unpack your delivery and store appropriately as soon as is possible! Can I change the date or timeslot that my order is to be delivered in? Does the price of delivery change depending on what suburb the order is delivered to? No, we have a flat rate $9.95 to all suburbs we service. Am I able to have my order delivered at a specific time within the delivery window I have specified? We use a third-party courier company to carry out our deliveries and, unfortunately, cannot make requests to have your order delivered at an exact time specified by you.